SUMMARY: Incorporating social media icons in email sends is a common practice for most companies. However, when online wedding marketplace WeddingWire wanted to increase its Pinterest presence, it looked to these icons and discovered how ineffective they actually were. Through testing, the brand was able to develop an email strategy that grew its Pinterest following without drastically altering its sends. 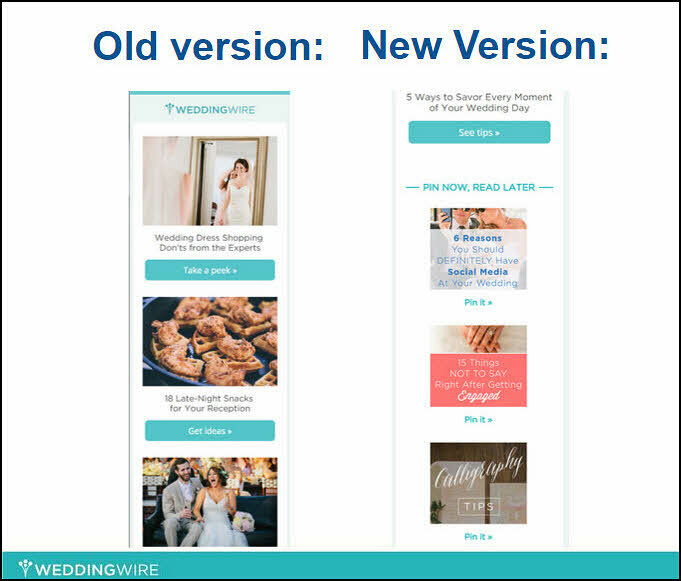 Learn how WeddingWire was able to increase its email re-pins 31% and build its Pinterest community by integrating pins directly into its weekly email newsletters. WeddingWire is a leading online marketplace in the wedding sphere. Its mission is simple — alleviate some of the big day stress by connecting engaged couples to community-reviewed local and national vendors. Due to the nature of its marketplace format, WeddingWire serves two main client bases — engaged couples and vendors. 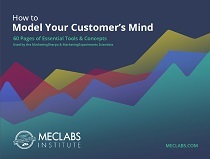 Along with a medium to connect these two different customer segments, the brand also provides tools specifically designed for each of its consumer bases. "We also offer wedding planning tools for [engaged couples]. Things ranging from a hashtag generator tool to an online budgeting tool," Bart Thornburg, Senior Email Marketing Manager, WeddingWire, said. "We have tools for the wedding vendors as well. Things from CRM and other tools to help them run their business more efficiently." The company features wedding vendors known around the country as well as international vendors. The team at WeddingWire wanted to increase the brand's presence on the social media site Pinterest, which is known for having a strong wedding planning community. Specifically, they wanted to increase the brand's Pinterest following and engagement rates while facilitating the sharing of wedding-based content. "It's one of those social media platforms that right now is just saturated with a lot of content on a daily basis," Elizabeth Stiles, Social Media Manager, WeddingWire, said. "We wanted to find a way to cut through that clutter and, with that, use our current users to engage with us on a different platform and channel." To increase the online marketplace's social presence, the team at WeddingWire looked to an aspect of email marketing that almost every brand uses yet few test — social media icons. 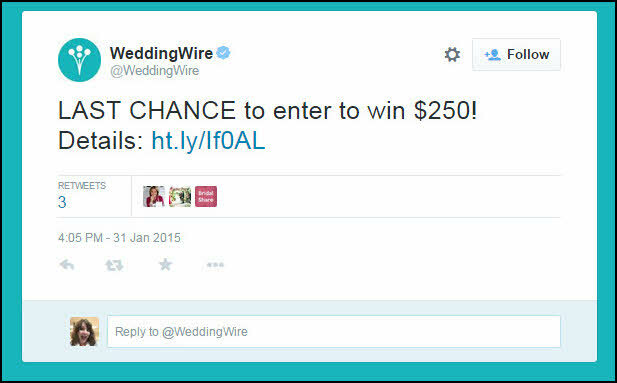 After launching a Pinterest-centric sweepstakes, the team at WeddingWire started testing the effectiveness of send-integrated social media sharing options. Learn how WeddingWire was able to increase its Pinterest follower growth rate from email newsletters 141% by tweaking its social media approach in its email sends. To inform consumers about WeddingWire's presence on the social media site, the team ran a Pinterest-focused "flash contest." Named the Pinspiration Sweepstakes, this contest ran in the beginning of 2015 for one week and focused on increasing followers. Contestants were asked to follow WeddingWire on Pinterest as well as to provide their email address and date of their upcoming wedding to be entered for a chance to win $250. The sweepstakes was promoted on the brand's other social media channels, which include Facebook and Twitter. While other social media channels were used in the promotion of this sweepstakes, one of the main goals of this effort was to use the brand's email newsletter to foster its Pinterest community. This email send was designed to not only encourage consumers to follow WeddingWire but to start engaging with its content immediately. "It was more telling our users that we are on Pinterest and, if you want inspiration, come and follow us," Stiles said. "Then, we all collaborated to figure out a way of how we can get them not only to follow us but also engage with us." This engagement came in the form of three pins that were embedded in this dedicated send. These pins were specifically chosen based on well-performing content pieces and allowed the recipient to easily pin these specific pieces of content right to their Pinterest board. This approach was taken into account because of the nature of Pinterest. The team hoped that if consumers pinned their content, these consumers' friends would then share the content, thereby creating a viral effect while growing WeddingWire's Pinterest presence. According to Stiles, the engagement WeddingWire saw from this flash contest effort, "wasn't a lot, but it was very successful for the short amount of time we ran it." However, she added, this send produced high clickthrough rates for the pinned content. After seeing the success of pinned content in the Pinspiration Sweepstakes, the team started brainstorming ways to incorporate pinned content into the brand's weekly newsletter sends. For their first test, the team added an additional section to the weekly send that directly integrated pinned content to pin. This section was titled "Pin Now, Read for Later" and was placed on the bottom of the newsletter send. For this first test, the team used the same three pins that were used in the dedicated email for the flash contest. These three articles were again chosen because a previous send had determined them to be the brand's top-performing articles. Each article link included a relevant image as well as a "Pin it" CTA below the image. While this email test did not result in new opens or clickthroughs, because the email had to be opened in order for consumers to tell that the new section had been added, the "Pin it" section at the bottom did produce a significant amount of clicks. This test showed an impressive increase from WeddingWire's former social media icon strategy. Prior to this test, WeddingWire's social media strategy for its email sends was largely limited to the same tactics most brands use — linking a handful of the brand's social profiles at the top of the email template. Historically, the team at WeddingWire had seen traffic generated from its Pinterest link on only a few occasions. In comparison, WeddingWire's "Pin Now, Read for Later" section increased the brand's Pinterest follower growth from its newsletters by 27% compared to the brand's average growth rate. Re-pins from email also saw an average lift of 31% per pin but some reached as high as 180%. These gains also had the added benefit of growing WeddingWire's Pinterest presence. "Once they're in there — in our Pinterest account — they're actually engaging with us with re-pins and clicking through our content," Thornburg said. After seeing the success of the "Pin Now" section in its email newsletter, WeddingWire kept this section in all subsequent sends. However, the team wanted to continue testing its Pinterest options in its email sends. "It did take us a few weeks to start thinking about, 'OK, what else are we going to test?' But some concept of this pin ... at the bottom has been running in our newsletter," Thornburg said. "We really haven't stopped doing it yet." Specifically, the team was interested in learning what content its audience preferred to pin. They sought to test more text-heavy articles against visual pieces, such as images or Pinterest boards. This effort took place in May. The team tested the article-based "Pin Now, Read for Later" section against a "Pin-Worthy Photos" section, which was designed to include inspirational photos. The goal of this test was to see what type of content consumers engaged with more: articles, inspirational photos or Pinterest boards. From this experiment, the team gained several key takeaways about their consumer base. The links prompting email recipients to follow a WeddingWire Pinterest board performed the worst, with inspirational photos achieving a 70% better clickthrough rate than Pinterest boards. However, articles were the clear winner, with pinned articles achieving a 250% increase in clickthrough as opposed to inspirational photos. The team hypothesized that the overwhelming success of articles over more visual options was largely due to their specific and informative nature. "There's more to the articles," Thornburg said. "'Six reasons you should definitely have social media at your wedding,' 'Fifteen things not to say right after getting engaged' — those are very specific ideas, and they really give a lot more detail about what comes after the click." He added, "Rather than the photo, it's just a photo. Everything is there already." Another contributing factor to the success of articles over other options was the intention of WeddingWire's email newsletter. Typically, the brand's newsletters are article-heavy, and articles perform better than more visual options, such as galleries, the team explained. This expectation to see articles in these weekly newsletter sends may have translated into the popularity of certain pinned content pieces. 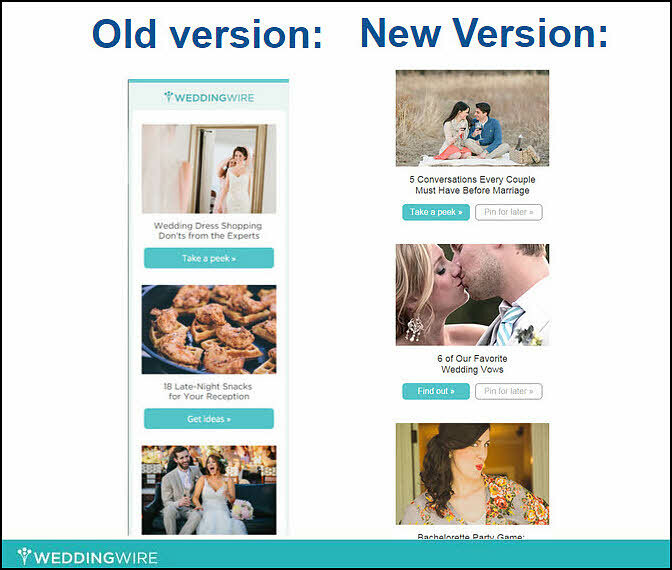 Finally, the WeddingWire team ran a third test, this time to determine whether or not the CTAs for all of the content in the newsletter could be used to boost Pinterest engagement. "We said that, 'Okay, we know that our users are really liking and engaging with our content on Pinterest.’ Part of it might be this whole concept of 'I can't necessarily read all of your articles now but I would like to either share or save this content,'" Thornburg said. "Pinterest is a really great way for saving and sharing and collecting inspiration in content." To make all email content more accessible on Pinterest, the treatment added a secondary "Pin for Later" CTA to every piece of content. 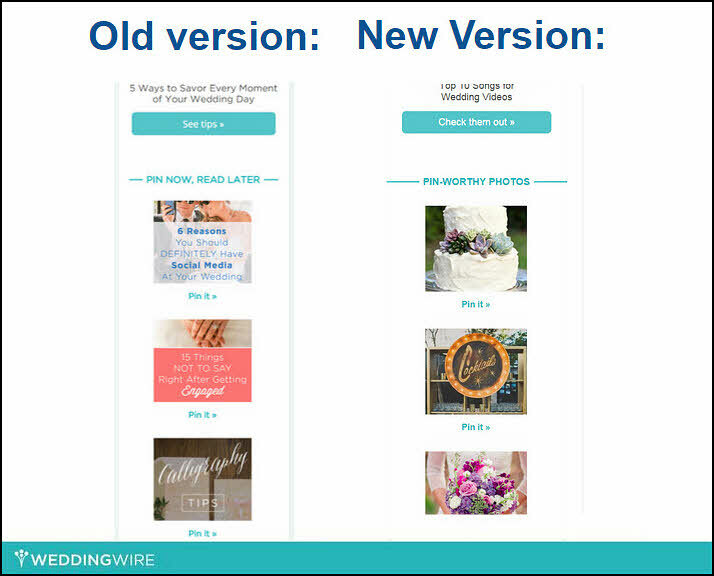 While this effort did not negatively impact email performance, the WeddingWire team did not see the clickthrough rates the "Pin Now, Read for Later" section produced. This test produced the same number of unique clicks, but there were only a few dozen clicks on the "Pin for Later" links, Thornburg said. "One of our key learnings from that is that users are going to engage with our Pinterest content via email only if the content is not already available directly from the email," he said. Through this Pinterest integration campaign, the WeddingWire team discovered a new, more successful method for integrating social channels in the brand's email newsletters. One of the most powerful takeaways from this effort was the importance of testing every element of email sends. "[A social media icon section] is something that probably every email in my inbox from other companies has, and this [being] a low hanging fruit made [it] a very unsuccessful tactic for probably every company ever," Thornburg said. "Their social integration strategy is just to put those four icons and sometimes eight or 10 icons in their email template and just hope that people click on those. That's not actually very successful." "There's a strong argument after the test for taking them out and just replacing them with this actual integrated content," he added. Looking forward, the team plans on using the lessons they've learned from this Pinterest incorporation campaign as they build WeddingWire's Instagram community. "Instagram definitely being so photocentric, [it's] the next place for us to go with this," Stiles explained. "We're excited about doing this with Instagram and seeing if there's a big difference between how our users interact with Instagram and Pinterest." When asked what advice he had about attempting a social media incorporation campaign, Thornburg pointed to the same advice he suggests for anything involving email. "Anything with digital marketing is test, test, test. Assume nothing. Be bold in your ideas and float a test out there," he said. "Look at the resources that you have around you, all the expertise that you have around you and be curious and ask people." Bart Thornburg, Senior Email Marketing Manager, WeddingWire, will be speaking on this campaign at MarketingSherpa Summit 2016, held February 22-24 in Las Vegas.